South Asians who loom into social justice tend to primarily address cultural appropriation. And for many, it stops there. Yes, I understand the significance of non-South Asians adorning the pottu—there are thousands of stories of how South Asians are belittled when we wear it, how we never had the safety and space to wear them in the Western sphere, and how it is unfair that others can now adorn it with praise and safety. 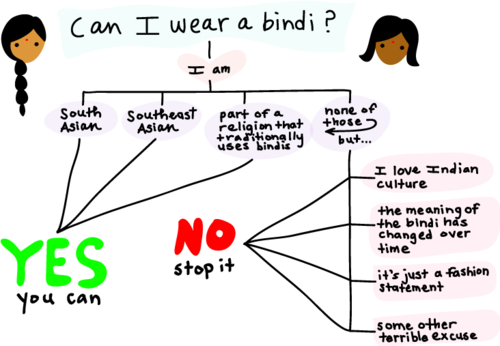 There is validity in these “my culture is not a costume” slogans, but I insist that South Asians additionally address other issues. See, social media has become a means of engaging in activism, and it makes sense—it’s accessible, you can advocate within minutes and you can garner a substantial following. I think that may be part of the appeal of addressing cultural appropriation—it isn’t too radical, it’s aesthetically appeasing to have a diasporic look, and social justice is in (cc: Pepsi). I agree that it is awesome that we can adorn pottus with regular Topshop jeans and make a look, and how we can come together as a community to collectively denounce our culture’s appropriation. However, when I sit here, in Toronto, which hosts the largest number of Eelam Tamil refugees, and we are talking about cultural appropriation rather than the gendered violence that is nonchalantly occurring in our households, or the implications of casteism practiced in our community, I can say our priorities are out of touch. Women who are widows are forbidden from wearing the pottu because their human worth is premised in the livelihood of their male partner. Many widows find they’re sanctioned from society because of the death of their husbands. There is an unsaid acknowledgement that prohibits widows from adorning the pottu. Widows deserve worth, and the pottu, to a degree, tends to assign that within South Asian culture. Most of the appropriation discourse centers around the pottu, henna, the nath, etc. There are narratives of how we were bullied and terrorized when we adorned the pottu when we were younger. It’s unjust. It is, and I think that this narrative is important to be aware of, but let’s couple it with other narratives that South Asians experience. It’s not our only struggle. Furthermore, at least within the Tamil community, if you’re going to reclaim the pottu, reclaim it also because many Tamil people believe the “traditional girls worth marrying” are ones who adorn the pottu. It is never the girls who shows skin or are revealing or don’t conform to traditional morals (whatever that means). Reclaim the pottu because we don’t wear it for the male gaze to identify as marriage material, we wear pottus because we are connected to our culture and our mothers. We seek semblances of home in other women wearing the pottu. We use the pottu to ally ourselves with women who yearn to balance everything that it means to be a refugee inside and outside of the West. There are other reasons we should reclaim the pottu within our community. I strongly believe that many of the oppressed in our motherlands, or ideas of land, or whatever your identity might possess, aren’t concerned about white people wearing the pottu. Most of the oppressed people in the West aren’t concerned about white people wearing the pottu. They’re concerned about making it to the next day, about their caste identification as revoking their membership to the larger diaspora, to be conscious of the bodily space they occupy, to constantly be seen as counterfeit. Cultural appropriation is definitely a great start to social justice advocacy, but let’s expand our advocacies. It’s also just bizarre to see many South Asians who appropriate black culture take stances on the appropriation of South Asian culture. What? That makes no damn sense. I don’t know, maybe it’s our privilege as South Asians that made it to the West, but many of us are upper caste, have a degree of wealth, formal education, etc. We need to start talking about larger issues that pervade our community. Y’all can talk about caste, or alcoholism and abuse in the home, or the gendered experiences of South Asian women, or how South Asian women have some of the higher suicide rates, or Islamophobia, or Hindu nationalism that suffocates lower caste folks and those who don’t practice Hinduism, or the persecution of LGBTQ South Asians (in and out of South Asia), or common discrimination against Tamils in the community. It’s up to you, but I urge that our discourse expands to force self-reflection and narrow in the dynamics of our community. I will narrow in on casteism in this article because there are still ideas of Dalit folks that are retained in the West, which forbids inter-caste relationships, employment of Dalits and the basic humanity of Dalits. You must understand that pre-colonial depictions of Dalits coming from the feet of Brahma made Dalits embody everything that is impure. This is a distinctive effort in dehumanizing a specific group of people for the purpose of other groups (upper caste folks) retaining power. They are quarantined to only lower wage jobs, are constantly disposed of and murdered within the South Asian landscape, and are subject to constant dehumanization through spectrums of employment, marriage, inherent human value, etc. When someone asks “what village is your family from” it is a question to discern what caste you are. Not that innocent, huh? Look at the violence happening to and within your community and please your platforms to proliferate awareness about those issues. I can’t concisely say this is the next thing we should talk about, but I’m sure your identity, whether woman and/or queer and/or working class, etc. will help your determination of what you choose to address. There are SO MANY THINGS that we as South Asians can address, and I urge you to use these platforms that are now so accessible to be advocates against these forms of pain and scrutiny in the South Asian community. Engaging in pottu advocacy is easy and aesthetically pleasing. I am unimpressed by the self-indulgence and simplicity of engaging in what is easy. Listen to your family’s stories and do research. Probe into everything that is complicated and multifaceted about being South Asian and find out why. Just do better. *Pottu is the Tamil translation of bindi in Hindi. Western dialogue of South Asian concepts get overshadowed in Hindi rhetoric. Pottu is what I will use because that’s what I know as a Tamil woman, and because Hindi isn’t the only language that occupies South Asia.